Want some music suggestions from your friends but don't really want totalk to your friends? Well, Facebook has you covered: The social network has added an "ask" feature that makes it simple to garner entertainment recommendations from your friends. When you click onto a friend's profile, scroll down the left side of the page to his/her music, books, movies or TV shows section. Underneath his/her picks, you'll see a button reading "ask" next to the line "Ask [friend] for a music recommendation." When you press "Ask," you'll be able to fill in a text box specifying what kinds of tunes you're looking for, as well as add more friends to the query. 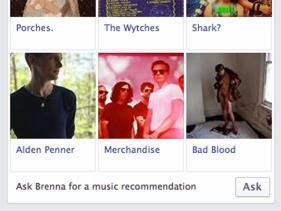 When your friend receives the request, they can either answer with recs from their own Likes, or search for a specific band. After clicking on the recommendation, you can add it to what appears to be a new section of your profile titled "Listen Later" for music, "Want To Watch" for movies and TV and "Want To Read" for books. There are still some kinks to be worked out with these features — each section also boasts suggestions, and all my music suggestions are bands I've recently listened to on Spotify — but the "ask" button could be a cool way to crowdsource new tunes.